Are you looking for a new camera? Check out PC Mag's "Best Small Digital Cameras". If you need more information about camera specs, or maybe you're just curious about megapixels and resolution, check out the informative and easy-to-read article, "An In-Depth Look at Megapixels and Resolution". Here you can find out more about the latest cameras from Canon, Nikon or other SLR's as well as camera phones. What was your favorite film camera and what's your favorite digital camera today? Pictures are everything... ScanMyPhotos.com makes yours last a lifetime and more. Do you hoard digital files? Maybe you can't seem to dig yourself out of a seemingly endless onslaught of emails? Melinda Beck's article, "Drowning in Email, Photos, Files? Hoarding Goes Digital", published by The Wall Street Journal today, delves into digital clutter and what we can do to organize our digital lives. Beck writes, "There isn't a set number of emails in an inbox or photos saved that defines a hoarder. Accumulating crosses the line into hoarding, experts say, when it is disorganized and dysfunctional and gets in the way of other relationships and responsibilities." Do you accumulate emails, photos, music, videos or games to a point that disrupts other aspects of your life? You're not alone. Beck continues, writing: "Christina Villarrreal, a cognitive-behavioral therapist in Oakland, CA says she has clients in the tech industry - young men mostly - who spend so much time and money amassing collections of music or games or gadgets that they withdraw from the real world. 'They can't pay their rent or buy food because they have to have this latest piece of equipment to support their habit', says Dr. Villarreal." If you or someone you know accumulates, collects or hoards digital files, read Beck's article as a starting point for your own research. What causes hoarding? Dr. Villarreal noted that "hoarding often starts out as a way to feel good or fill an emptiness in life, but it leaves sufferers even more isolated". From another perspective, that of a National Association of Professional Organizer (NAPO) member, founding member of the NAPO-Baltimore Chapter and President of the Institute for Challenging Disorganization, Katherine Trezise says hoarding "comes does to fear and indecision." Check out Beck's article for much more information on digital hoarding, digital clutter and a disorganized digital lifestyle. What are the absolute best ways to scan and digitize photos? Professional personal historian Dan Curtis recommends ScanMyPhotos.com. Read his post here. Need a new Facebook timeline profile cover? Create one using InstaCover from Instagram. Read about InstaCover here. Suggestion: allow the professionals at ScanMyPhotos.com to scan and digitize your printed photos and then include the scanned images in your new Facebook cover photo. 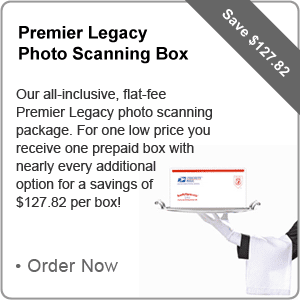 Take advantage of a major discount on nearly all of ScanMyPhotos.com's photo scanning upgrades and options with the Premier Legacy Package. For one flat fee, you receive a photo scanning box with nearly every additional option including a photo restoration for a total savings of $127.82 per box! Pictures are everything... we make yours last a lifetime and more. Spring is around the corner! That means millions of people will be cleaning out their closets, decluttering and organizing. 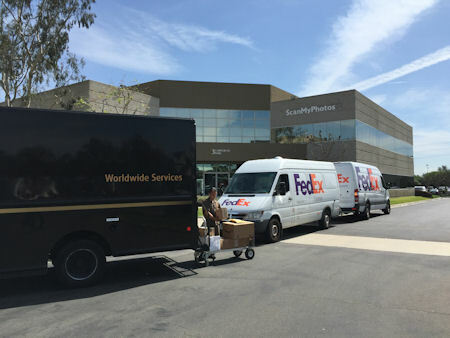 One extremely important facet of spring cleaning is preserving, protecting and organizing your precious, irreplaceable photo memories and there's no better way than using the professional services of ScanMyPhotos.com. Need inspiration for "Getting a Jump on Spring Cleaning"? Read the aptly-titled New York Times article written by Bob Tedeschi. Visit the Online Specials tab at ScanMyPhotos.com for valuable specials and discounts on professional photo scanning services. 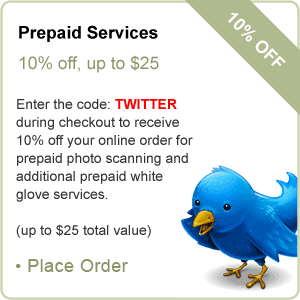 Take 10% off (up to $25 value) with coupon code TWITTER! Buy 3 prepaid photo scanning boxes for the price of 2 (value of $225 at 300 DPI or $365 value at 600 DPI)! Buy 3 photo index books for the price of 2 ($200 value)! Our very popular photo scanning box special is back! 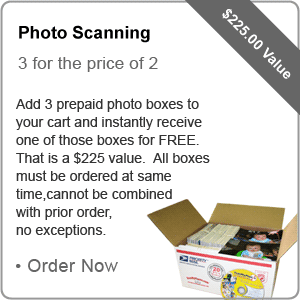 Buy 3 for the price of 2 photo scanning boxes - value of $365 at 600 DPI or value of $225 at 300 DPI. 600 DPI allows for photo enlargements at a later date. Let the professionals at ScanMyPhotos.com preserve your precious photo memories for a lifetime and more.